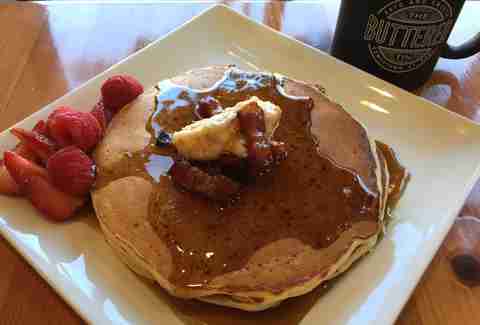 Obviously bacon with breakfast is a no brainer, but instead of throwing a few soggy (or overcooked) strips of bacon on the side of the plate, it's nice when someone, like our friends at St. Paul’s The Buttered Tin, goes to the extra effort of making a salted-maple-bacon butter you can put on their already sweet pancakes. While hot dogs might be somewhere in the same realm as bacon, when you put the two together, a symphony is made. Fortunately for us, the folks at Sonora Grill get that, so they’ve gone ahead and wrapped their dog in a blanket of salty bacon, just to be sure that you’re getting your daily pork requirement. 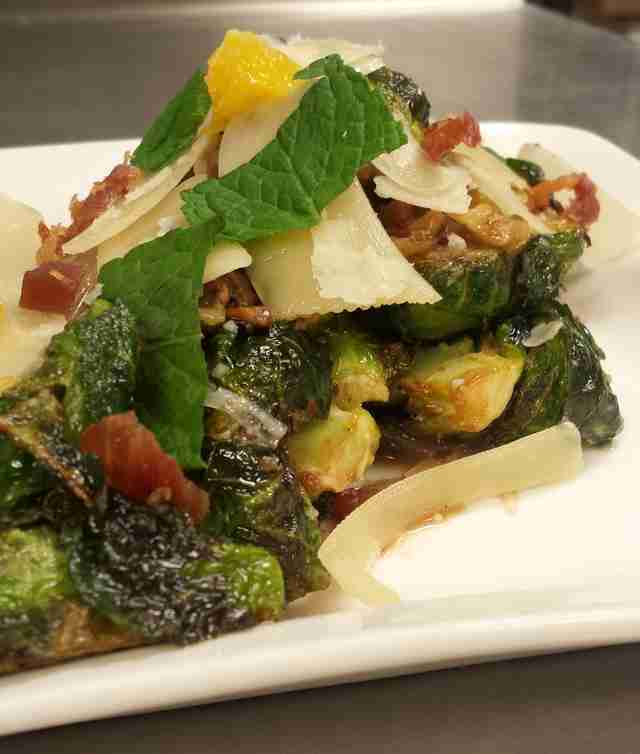 If you’re still living in a world where you think you hate Brussels sprouts, let us just take the time to tell you that you’re probably wrong. If you require proof, head over to The Rabbit Hole. We’re pretty sure that the combination of the nutty greens, along with bacon, onion, mint, orange, walnuts, and Parmesan, will change your mind. 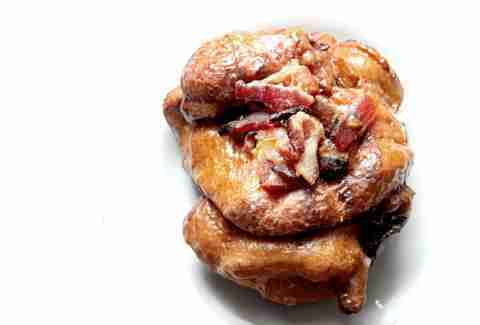 There’s just no arguing that the sweet and salty combination is a flavor profile made in heaven, and the Pinup Girl, or apple-bacon fritter, is quite possibly the perfect example of it in MSP. Bacon is undeniably an beautiful foodstuff. It’s nearly perfect on its own, so why muck it up by combining it with other foods? Sometimes all you need to do is put a couple of fat slices on a plate and call it a day. That’s what they’re doing at Manny’s and they’re charging nearly $20 for it. But it's soooo worth it. 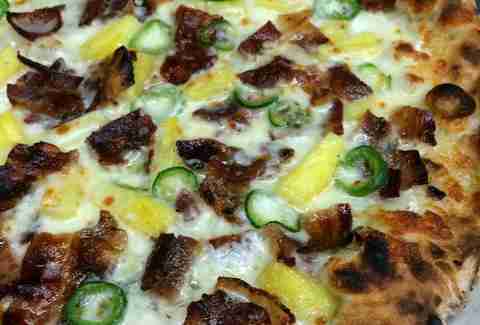 Everybody loves a good Hawaiian-style pizza, so it stands to reason that everybody would also love the absolute best Hawaiian pizza, which is why the folks at Lola, which is consistently named best pizza in the Twin Cities and has had several national nods too, have put bacon on theirs too. 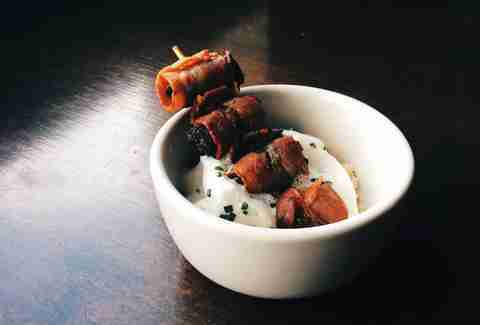 What are Devils on Horseback? 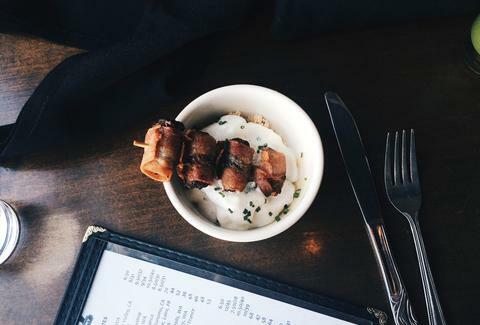 Oh, they're just blue-cheese-stuffed dates wrapped in bacon and then set adrift in blue cheese foam. The whole thing then gets a dusting of candied cashews and chives creating an indefensible and balanced flavor profile like no other. If you’d never heard of these until now, you’re welcome. This Uptown institution comes on strong with its excellent beer list, late-night food options... and its treatment of bacon. Its incredibly delicious Muddy’s Burger comes topped with bacon yes, but that bacon has been chicken fried to ensure that it retains all of its natural healthy qualities.